OMAHA, Neb. (KMTV) — Just standing next to the highway can be intimidating, and Highway Maintenance Supervisor Bill Kinser and his crew with the Nebraska Department of Transportation have to work on it everyday. Even with the signs and neon vests, Kinser says drivers don’t seem to see or notice his crew when they’re working. According to NDOT, in the last 20 years the lowest year for workzone related crashes was in 2007 with 386. 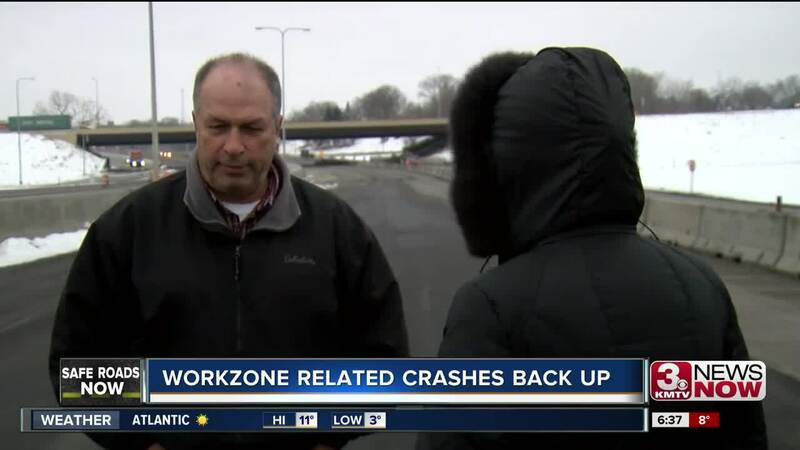 In 2018, there were 926 workzone related crashes. Of those 926 crashes, 205 people were seriously injured and three people died. NDOT Highway Project Manager Rick Fisher says too many of those crashes could have been prevented. “There are several wrecks out here a week. Mostly due to driver error,” said Fisher. Fisher says rear-end crashes are the most common thing he sees. “Usually the next one hits the next one, you know, it’s not good,” said Fisher. According to NDOT, there are three things drivers can do to stop these crashes from happening: slow down, pay attention and be aware of the driving conditions. If drivers follow these tips, Kinser says the odds of a crash go down significantly. If drivers do this he says it will give his crew a chance to fix the roads and keep everyone working and driving on them safe.